The 9.5 Laura Bay came about from a phone conversation I had with a local yacht designer who was looking for a dingy around that size to be the tender of one of his custom designs. The original design was for a boat of around twelve feet, so I adjusted the dimensions in the reduction to maintain the same visual lines that I had in the first design. All of the Laura's, from 9.5 to 14 feet, were the result of a multi-chine, eight panel design, work in progress that was to be my "Plyzar". 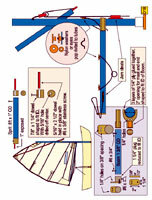 A plywood stitch and glue version of the popular Laser, with a hull that could be built at home for under $1000, and use a standard Laser sailing rig. The only concept change for this hull was the movable center seat and the arched mast partner. On a small hull it's hard to get the seats just right for more than one person. 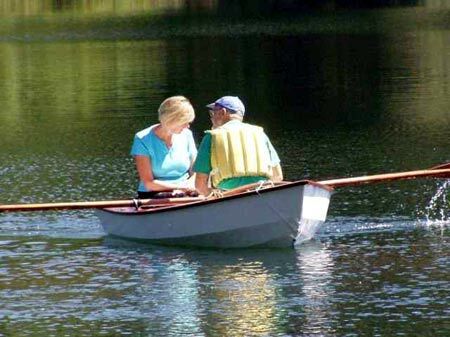 The usual way is to have a "T" seat; with a fore and aft section that transitions into the bow seat. This works, but limits leg room and storage in the forward area. On this boat I installed what I call "seat wings" on both sides of the hull, with a movable center seat section that has pegs on the ends. The seat wings are wide enough to allow the seat to move forward as the hull narrows at the bow. 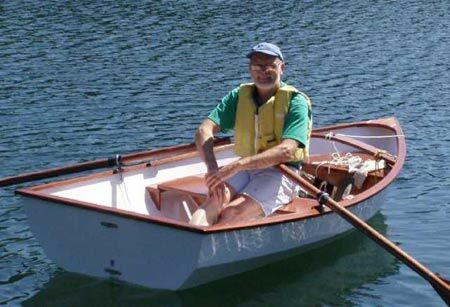 With one person rowing, the seat and oarlocks are in their aft positions; with a second person in the stern seat, the middle seat and oarlocks are moved to their forward positions and the boat is balanced again. Differing weights of passengers and cargo can be compensated by drilling extra holes in the seat wings to bring the boat on it's lines again. This version is now the standard seat setup on all my designs. 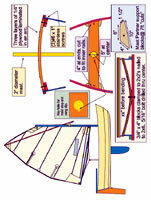 The sailing version uses a standard Optimist rig, or a build it yourself method is shown in the plans. The removable arched mast partner and attachment wings were another item that was added to this hull. The CLR and CE created a mast placement that wasn't close enough to use the bow seat for support. I like this idea better as the elevated arched partner gives the mast more support and is removable if you need the extra seat. 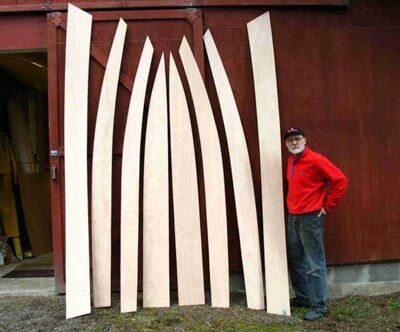 The plans also show how to construct real NACA 0000 foil sections for the gybing daggerboard and rudder. 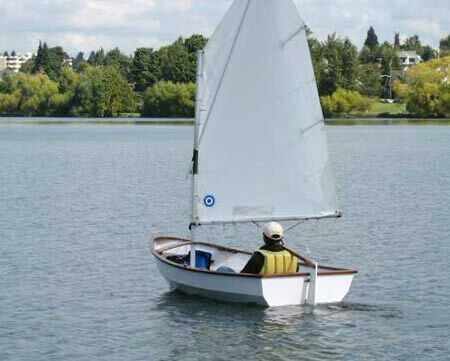 The other nice thing about the movable center seat is that if you go sailing, you can put the seat in the forward position and its out of the way, or just leave it at home. The daggerboard housing is wide enough to act as a full seat if you need to use it. Laura rows as well as any 9.5 foot boat, but I would rather take her sailing. She does it well, has no bad habits, and can really scoot across the water. instruction manual - perfect for the first time builder.